Wulfwyn working outside in a temporary sailcloth shelter. Although every family cooked their own food, for those who could afford them there were also 'professional' cooks and bakers in Viking Age Britain. As you can see from the title, the name Baxter comes directly from the Anglo-Saxon word Baecestre, this being the female version of the job title and Baker being the male. Bread was the staple food in the Early Medieval diet. 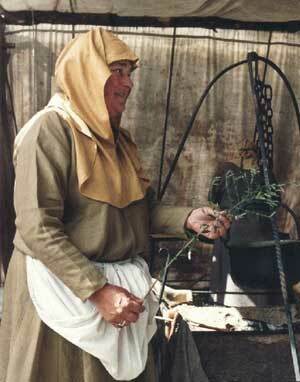 It was included with virtually every meal, and was made from ground Rye, Wheat, Oats or Barley. Whichever you used was dependant upon the area you lived in, the time of year, tradition in your area and what was left in the flour bin. It was also padded out with acorns and much worse in times of famine, or if your merchant was a complete rogue. The grinding of the grain was done with a grindstone called a Rotary Quern, or a Hand Quern (a small stone on top of a larger stone with the grain in between) if you were poorer. All the rotary types work by suspending one stone with a slight gap in between. The top stone has a hole in the centre about two or so inches across. Wedged in the gap is a bar of wood called a 'Rynd' that sits on top of the wooden pivot that is anchored in the lower stone. The rynd allows the grain to pass down either side of it enabling the grain to be spread between the two surfaces. The rynd can be tinkered with to alter the gap between the two stones so that different sized barley, wheat and oat grain can be ground efficiently. These stones were made from fairly local material if a suitable type was available. 'Rhenish' lava from northern Germany was a favourite throughout northern Europe, and was traded widely. Depending on the volume of grain you needed to grind, the other option would be to take it to the Miller who would charge you to do the job. Whilst back at home, this process had to be done every day to ensure there was enough flour for the family. The stones for the larger mills were up to nearly four feet across, but the querns used in the home were only 18 inches to two feet in diameter and four inches thick. And when they became worn out or broke through use, they were used as building material in walls, or as porch steps. Even today, the huge stones from 19th century are still sought as decorative garden ornaments. The dough was kneaded in a wooden trough sometimes called a trencher. This was made from a split log, which sometimes reached a vast size; although anthropological studies have shown that the larger ones may have also been used to lay-out bodies, or as water troughs for animals. A rotary quern in use. The flour seeps out between the seams of the upper and lower stones and gathers on the cloth underneath. Kneading was done kneeling or sitting on the floor with one end of the trencher between your knees, and the other resting on the floor. This means that you can bring your bodyweight to bear whilst kneading, therefore making the process easier. The larger troughs may have had a frame to support them or have been placed on a table or bench at waist height. Leven or yeast is commonly added during mixing. Yeast ( gist ) was cultivated by keeping a portion of dough from the previous mix in water or a damp cloth. This is often called 'sour dough'. The inclusion of yeast results in fermentation and causes the dough to rise, if it is left in a warm place. Yeast also occurs naturally in the atmosphere, and any dough that is made and left will therefore rise to some extent, depending on the ambient temperature. The process of fermentation converts sugars in the dough to carbon-dioxide which causes the bread to rise. With baking, the yeast is eventually 'killed' halting the process. What Saxon and Viking loaves looked like and what size they were is anyone's guess, but it should not surprise us find out that they were well regulated by local by-laws if put up for sale. A wooden trough or trug used for kneading dough mixture. 'Feasting and Fasting' - General information on feasts and fasts in the period. 'Food and Drink' - General information on food and drink in the period. 'Oven Building' - Results of some practical experimentation in Viking Age oven building. 'Acmylen'- An article about the Estate's watermill. Last updated 25 March, 2005 . Article by Roland Williamson 2002 (illustrations by Roland Williamson and Colin Levick).